john4jack (Corvallis, Oregon, United States) on 18 November 2009 in Transportation and Portfolio. Of course, I have to share this song! A stunning image! Look at these colors. You were standing there ready for this one!!!! whooo jack! chugga chugga clack clack. what a great, fun photo. This is really a topfoto, great shot! Just lying in wait, ready for the hold-up !!! You know that feeling when you see a great shot? I am feeling that right now. I recall a similar shot presented in monochrome... This one is even better! Love the colours and the composition is superb! Bravo! Wonderful framing and colors ! I like the way you have framed the train and the way it climbs out of the terrain. This is an exceptional photo. Stunning image, although I'm a sucker for steam! Absolutely excellent. It's just perfect. Brilliant shot.. amazing..!! Well done! You were obviously poised and ready for the perfect moment to shoot and you captured her wonderfully! A perfect vision. The frame is incredible. The light, color and texture excellent. I stay with the movement of heavy machinery in the curve. Ephemeral steam smoke but very beautiful. Perfect! Wow, there he is! Beautifull train in a magnificant landscape! Superb composition!. The light is sublime, i love steam smoke! Stunning image. For me everithing is perfect. Such wonderful soft light, colors, detail and compressed visual in this fine image Jack! Love the plumes of smoke!! I can smell the pine and the smoke. A fine shot of the coming train. I'm impressed with the wobbly condition of the tracks. The steam from the engine makes the shot very impressive. just gorgeous countryside -- an excellent frame between pine needle branches... love that steam!! A fabulous scene !!. Lovely light and colors. Jack! Wow! great color and capture! This is stunning. The steam streaming up through the trees, and the colors. Just fabulous!! A fantastic shot in the right moment, congratulates ! @jamesy: Thanks, Debbie. I'm glad; there certainly is more coming. GReat composition....you caught it from the perfect spot!!! and processing just makes it superb!! Jack, what a lovely shot. Luck of the draw or hard work paying off? @Mirza Ahmad: I have 12-15 shots; from when it was just hitting the curve until it was right on top of me. This seemed to me the best of the lot. "...and I ain't seen the sunshine since I don't know when..."
@Momo: Music and photography - they are mystically bound to each other. Excellent framing and picture. I love it. Get out of the way of the train's path! Beautiful backdrop of autumnal color for this composition! A perfect and fantastic shot, Jack! Perfect framing and wonderful colors. Bravo!!! No no no no no!!! This can't be happening... this is not even possible. Oh dear!!! This is a heart breaker. I am out of words now. Absolutely perfect! This is like a postcard--wonderful image. Wow, that is beautiful! I like those rippling rails. This is my favourite of all your train shots. This is just fantastic - 5 stars - I feel like I am looking back in time! This should be used in a textbook or on a postcard! Wonderful clarity on this train also! and I like how you framed the photograph through the trees! @Scott F. Schilling: Thanks, Scott. I heard your latest podcast; very nice. This is absolutely one of your best John, was this taken in Colorado? The colors , the smoke, everything is postcard perfect. @Denise: It's a part of the Sumpter series. This was the Sumpter Railway. Sumpter is in Oregon, a little north of Baker City (which is on I-84 in eastern Oregon). Sumpter is in the foothills of the Elkhorn Mountains. The colours are so rich gere, great shot! absolument superbe en tout point de vue ! j'adore ces vieilles machines qui sont devenues si rare en France ! I love the depth and clarity and great color in this one! This seems so timeless to me...Just like it must have looked in the 1800's. Wonderful series! very nice! looks like a painting to me. great shot. Stunning! That engine couldn't have looked more beautiful and better framed! I was wondering where you took this, but saw your comment reply that it was Sumpter. You really, really make me want to visit there with camera in hand. You are really nailing these shots. You picked a great spot to shoot this shot from. This is just lovely! 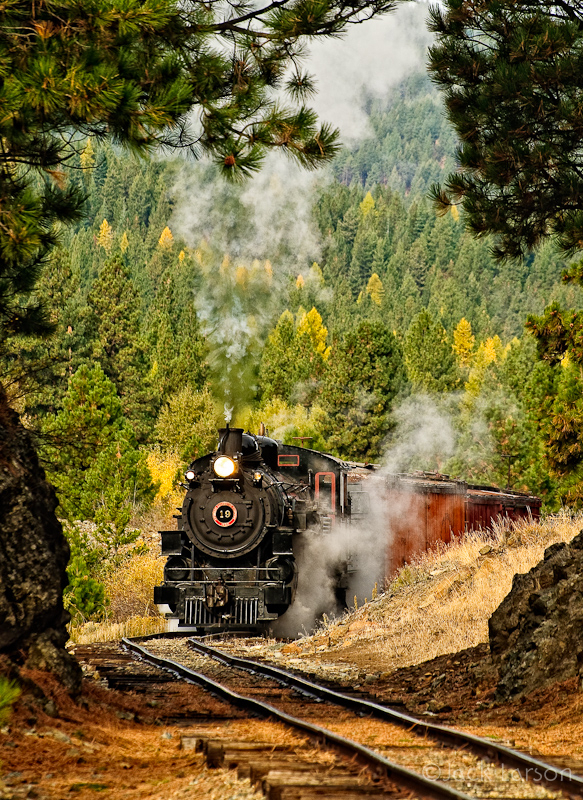 The steam train seems to be comng through the tunnel of trees you have chosen to frame it with. Great work! un petit air d'autrefois, dans une superbe lumière, c'est très beau.